This artist's impression shows a dark gamma-ray burst in a star forming region. 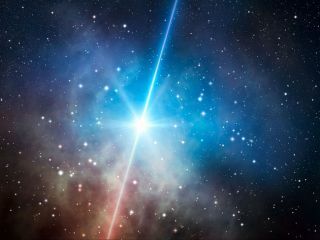 Gamma-ray bursts are among the most energetic events in the Universe, but some appear curiously faint in visible light. Someof the most gigantic explosions in space are curiously hard to see.That'sbecause space dust is blocking the view from Earth, suggests thelargest studyof these blasts, so-called dark gamma-ray bursts. Dustbetween these explosions and the Earth, it turns out, is the mainreason that so-calleddark gamma-ray bursts are so faint, but the distance ofthe bursts fromEarth also is important, the new study suggests. These bursts shinebrightly inthe gamma and X-ray parts ranges of light, but show barely a spark ofvisiblelight. Gamma-raybursts are fleeting events that last from less than a second to severalminutes, and are among the most energetic events in the universe. Theafterglows from these violent outbursts last longer than the initialexplosion,but have less energetic radiation. Anafterglow can last weeks, even years, after the initial explosion, andcan tellscientists about the objects that become gamma-ray bursts, and aboutstarformation in the early universe. Allgamma-ray bursts have afterglows that give off X-rays, but only abouthalf ofthem were found to give off visible light, with the rest remainingmysteriouslydark. The new study confirms previous work that suggested that obscuring dustwas the explanation behind why they appear so dim. Gamma-raybursts are detected by orbiting observatories that can pick up theirhigh-energyradiation. With data from a special gamma-ray-burst-detectinginstrument and NASA's Swift satellite, astronomers determined theamount oflight emitted by the afterglow of some bursts in different wavelengths,all theway from high energy X-rays to the near-infrared. Theastronomers used this information to measure the amount of obscuringdust thatthe light passed through en route to Earth. Previously, astronomers hadto relyon rough estimates of the dust content. Asignificant proportion of bursts are dimmed to about 60 to 80 percentof theiroriginal intensity by obscuring dust, but this effect is exaggeratedfor thevery distant bursts, letting the observer see only 30 to 50 percent ofthelight, the researchers found. Mostdark gamma-ray bursts are therefore simply those that have had theirsmallamount of visible light completely blocked before it reaches Earth. NASAlaunched the Swiftsatellite at the end of 2004. From its orbit above theEarth's atmosphereit can detect gamma-ray bursts and immediately relay their positions tootherobservatories so that the afterglows can be studied. Inthe new study, astronomers combined Swift data with new observationsmade usingGROND ? a dedicated gamma-ray burst follow-up observation instrument,which isattached to the 7.2 feet (2.2 meter) MPG/ESO telescope in La Silla,Chile. GRONDcan observe a burst within minutes of an alert coming from Swift, andit can observesimultaneously through seven filters covering both the visible andnear-infrared parts of the light spectrum. "Comparedto many instruments on large telescopes, GROND is a low-cost andrelativelysimple instrument, yet it has been able to conclusively resolve themysterysurrounding dark gamma-ray bursts," said Jochen Greiner, study teammemberfrom the Max-Planck Institute in Germany. Theresearchers report their findings in the Dec. 16 issue of the journalAstronomy& Astrophysics.